Presently two orcs came into view. 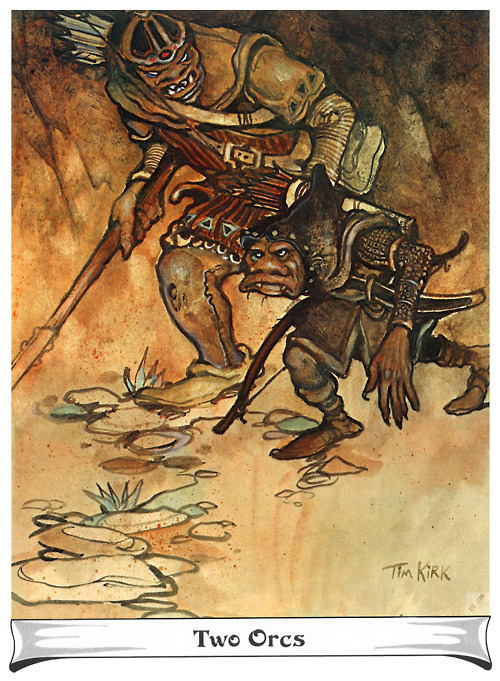 One was clad in ragged brown and was armed with a bow of horn; it was of a small breed, black-skinned, with wide and snuffling nostrils: evidently a tracker of some kind. The other was a big fighting-orc, like those of Shagrat’s company, bearing the token of the Eye. He also had a bow at his back and carried a short broad-headed spear. As usual they were quarrelling, and being of different breeds they used the Common Speech after their fashion. 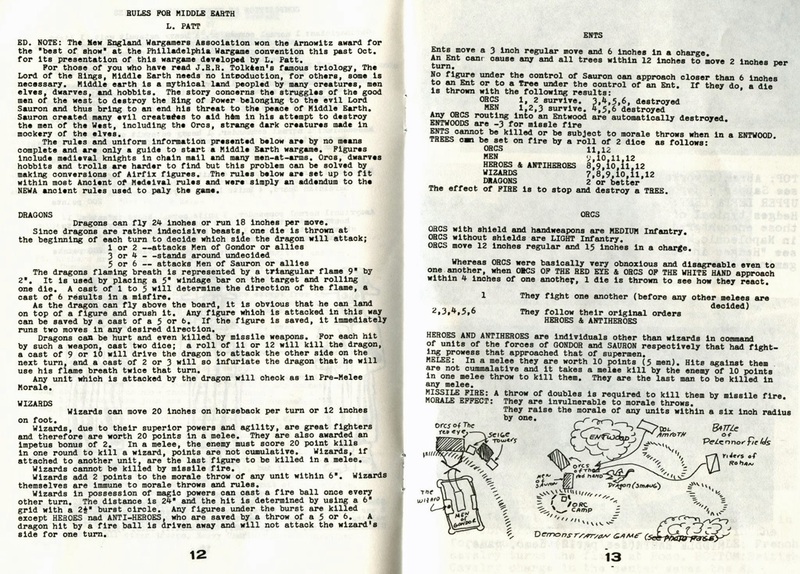 Jon Peterson has unearthed what may be the first published fantasy wargame rules, by Leonard Patt in his "Rules for Middle Earth" (RfME) as published in The Courier the newsletter of the New England Wargamers Association devised way back in 1970. 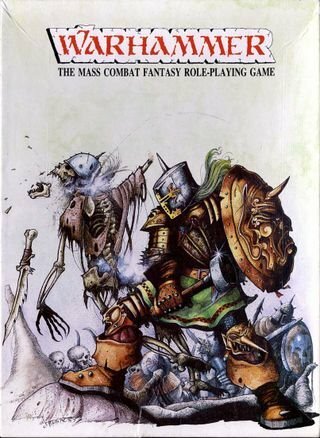 One thing stood out to me in reading Jons assessment of RfME which focuses mainly on it's textual and conceptual influence on Gary Gygax and Jeff Perrens Chainmail - that this is also, very likely, the first instance of a rule for determining the effects of inter-goblinoid animosity, the bane of every Orc generals life, and a mainstay of fantasy tabletop gaming for 40 odd years. Patt writes “Orcs were basically very obnoxious and disagreeable even to each other” and when they “approach within four inches of one another, 1 die is thrown to see how they react.” On a roll of 1, the orcs will fall on each other in a bloody mass of loathing and combat. 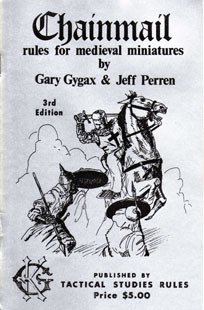 In Chainmail (1971-1975), which up until the discovery of RfME was long considered to be the first published fantasy wargames rules, Gygax and Perren have it that "if Orcs of different kinds approach within a charge move of each other, and they are not meleed by the enemy, they will attack each other unless a score of 4 or better is rolled on an obedience die." Chainmail of course, is the daddy of Dungeons & Dragons - the game that would dominate fantasy gaming throughout the late 70s and early 80s, and in the AD&D Monster Manual (1977) had quarrelsome Orcs with a chance of fighting among themselves 75% of the time. Middle Earth Wargames Rules by SELWG (1976) declares "all Orcs / Man-Orcs / Uruks will quarrel among themselves." Then gives a 1/6 chance of a quarrel breaking out. On the subsequent turn casualties are rolled for, with a 1/3 saving throw. Presence of a Nazgûl or an enemy unit mitigates the unruly behavior, and the Orcs just do as they're told. It's nice that Tolkiens language is echoed here in the use of the word quarrel, and it's also interesting that MEWR uses RfME's less likely 1/6 than Chainmails 1/2 chance. Of the ancient fantasy wargaming tomes I have laying around, Tony Bath's Setting up a Wargames Campaign (1973) Mike & Sheila Gilberts Archworld (1977), don't have rules for goblin quarreling - these being somewhat less Tolkienesque settings, and neither do they appear in Richard Halliwell and Rick Priestly's Reaper (1981) nor John Treadaways esteemed Lidless Eye army lists (1984) for WRG 6th Ed, which make no mention of inter-goblinoid fighting, nor does WRG 4th Edition's "Suggested adaptions for Sword & Sorcery fanatics" (1973). 1st edition Warhammer (1983) also has no rules for misbehaving goblins. However, in he supplement Forces of Fantasy (1984) this oversight is fixed with the introduction of the infamous inter-goblinoid animosity table. And whilst this applies to Goblins, not Orcs (although we must acknowledge the fluidity of the terms, creatures previously known as Red Orc are now termed Red Goblins, etc.) the basis and mainstay of Orcish psychology in the Warhammer game for the rest of its shelf-life from 2nd-8th edition is lain down here. In FoF a basic 1/6 chance is given of Animosity taking over, then a second die-roll to determine the Orcs behaviors, from no discernible effect to charging friendly troops. The behavior roll has several situational modifiers, from the ability of any unit leaders that may be present, to the presence of the enemy. The rules also suggest tracking animosity points, so that after a number of infractions, the regiments will hate each other and attack on sight - the rules as narrative generator, feeding grudges into battle. As such Warhammer seems to follow the structure of MEWR - roll for the chance of animosity happening, then roll for the effect. Rather than RfME or Chainmails single roll then subsequent inevitable infighting. Somewhat predictably, 2nd Edition Warhammer then turns this on it's head, having a single die roll 1/6 followed by a leadership test to rally the troops. 3rd edition has a single roll modified by the ld score, and later editions return to the mayhem of 1st edition. To Pippin's surprise he found that much of the talk was intelligible many of the Orcs were using ordinary language. Apparently the members of two or three quite different tribes were present, and they could not understand one another's orc-speech. There was an angry debate concerning what they were to do now: which way they were to take and what should be done with the prisoners. Tolkiens Orcs, be they skirting the southern the edges of Fangorn forest, taking the Hobbits to Isengard, or running amok in the tower of Cirith Ungol are not simply fighting amongst themselves because they hate each other (which they do, no doubt) but arguing about who gets the spoils of war - the prize of Hobbit captives, alive or dead, or the Bagginses Mithril shirt, or conflicting orders in Mordor. This suggests a more Tolkienesque model of Orcish behavior would have them be narratively motivated - the attainment of some prize or objective by one unit of Orcs, triggering the attempt to steal or usurp that prize by others nearby, so they may hope to earn glory from their masters. Similarly the clash of Orcs at the Isenmouthe that allowed Frodo and Sam to slip away causes minor scuffles and confusion, caused by different groups of Orcs trying to follow orders to occupy the same space, rather than bloodshed. Still, just rolling dice to have your own troops bash each others heads in is a venerable conceit, emerging from the dawn of the fantasy wargaming hobby, and certainly adds to the colour.